Beautiful Traditional Wooden Soldier style skittles finished with bold and non-toxic red and black paint. Orange Tree Toys provide a range of beautifully crafted traditional wooden products including a range of toys and nursery accessories, each packaged beautifully so they can be gifted or bought for your own lovely little one. 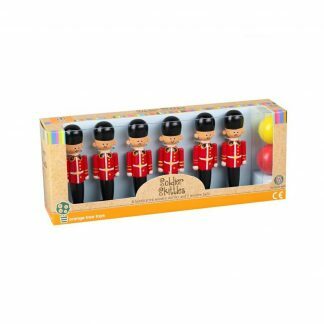 These classic wooden soldier skittles make the perfect traditional toy, line them all up or dot them all around and try to knock them over with the provided wooden ball. Providing hours of fun both indoors and outdoors!